This article was written by Polk5440 and edited collaboratively with the rest of the Dominion Strategy blog team. Do you want to contribute to the Dominion Strategy Blog? See this post on the forums for details! Bridge is the original megaturn card. 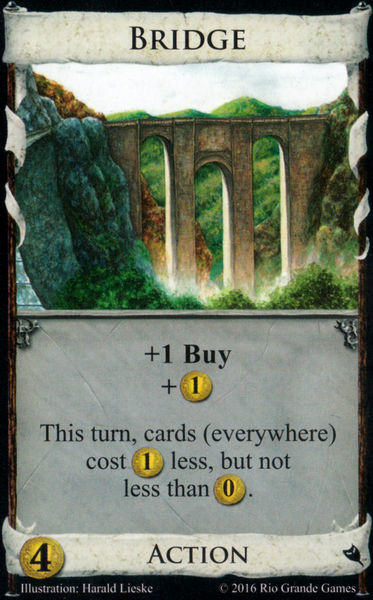 Instead of buying Provinces one or two at a time while slowly bogging down your deck with green cards, Bridge enables what feels like an alternative way of winning: building decks that let you play enough Bridges and have enough coin to buy the remaining Provinces (or otherwise gain enough points to win on a single turn). No accumulation of green cards is necessary! Now, gaining a lot of Bridges and then playing them in one turn usually takes some work; notably, draw and some kind of trashing or sifting is a must. While Native Village or King’s Court are particularly notable enablers, Royal Carriage might just be the best. Royal Carriage is a strong partner for Bridge because you only need one Bridge in hand to generate the megaturn: If you play a Bridge and call 6 Royal Carriages from Reserve, then that means Bridge is played 7 times (itself + 6 Royal Carriages), giving you 8 buys, $7, and Provinces cost $1. Buy Royal Carriage whenever you can (the goal is to get 6). Buy Silver (up to two) with 3 or 4 coins. 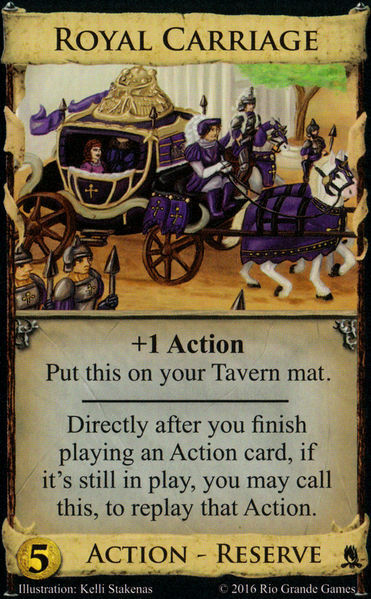 Once you have 6 Royal Carriages on the Tavern mat and a Bridge in hand, play Bridge, call all your Royal Carriages, and buy all the Provinces. Don’t buy more than 2 or 3 Silvers, but it is worth buying an extra Bridge if you aren’t worried about collisions. This will help you trigger the megaturn earlier by reducing bad shuffles where you are ready to activate, but the Bridge is shuffled to the bottom of your deck. If calling Royal Carriage on Bridge allows you to purchase multiple Royal Carriages, then do it. In fact, it is usually critical to do so for this strategy to be as fast as possible. In the absence of attacks or enablers, you should be able to gain 6 Royal Carriages in 8 to 10 turns and activate the megaturn in 12 to 16 turns. While this basic strategy can be improved upon with other cards in specific kingdoms, any deviation from the basic strategy must be made with the idea of executing the megaturn in a fewer number of turns. Conventional support that normally make decks better can make a Royal Carriage Bridge deck worse. Skipping an early buy of Silver or Bridge to buy a strong trasher like Chapel, then spending a turn later to trash your hand and not gain a combo piece is seldom worth it. Buying any other $5+ card, even strong attacks like Witch, means you did not buy a Royal Carriage and that also costs you a turn. However, junking attacks and discard attacks played by your opponents can make it harder to reach 5 coins to buy Royal Carriage. Knights and other trashing attacks can trash Royal Carriages making it hard to accumulate enough. In this case, some trashing and cycling cards can help mitigate damaging attacks. In spite of these potential concerns, Royal Carriage and Bridge is a strong strategy that should not be ignored. This tournament is sanctioned by Rio Grande, and will be a qualifier for the World Masters, if there is one in 2019. All players receive promotional cards! The competition will feature custom-designed kingdoms drawn from all of the Dominion sets and expansions, and will emphasize strategy and high-level play. Tournament seating is limited, so pre-register for the event here; just click on the ‘Add’ button and proceed through the checkout process. You’ll need a tournament ticket and a convention badge. If you can, I’d encourage everyone to pick out other games to play in and attend the whole game convention, which runs from Nov 9-11, all day (and late into the night Friday and Saturday). IMPORTANT NOTE: For those who have attended in the past, note that this year the tournament has been moved to an outbuilding: We will be on the upper floor of the resort’s golf clubhouse, and will have the area mostly to ourselves. You will need to pick up your tickets and badges first, at the con’s registration desk. This article on Storyteller was originally written by Will and collaboratively edited with the Dominion Strategy Blog team. Stay tuned over the next couple of weeks as we launch content relevant to the upcoming expansion, Dominion: Renaissance. Storyteller is a card unlike anything else in Dominion, being the only card to let you effectively spend your economy for massive amounts of non-terminal draw. In doing so, Storyteller both spends whatever virtual economy you’ve built up so far (the card itself providing $1, making it a cantrip when played alone) while letting you play up to 3 of your treasures. While this effect seems counterproductive at first glance, +1 card is almost always preferable to $1 as long as you still have cards to draw. Provided your drawn card is better than a Copper, turning your economy into cards will almost result in a better turn overall. Storyteller is a card that, at worst, plays itself as a cantrip, while potentially being one of the strongest sources of non-terminal draw in the game. What weaknesses could the card even have? In a vacuum, not many. Provided you’ve trashed your Coppers and Estates, 3 to 5 Storytellers and an ample supply of Silver or Gold can be the sole source of draw in a thin deck that consistently draws itself. Being able to consistently acquire 10-20+ card hands non-terminally is a major boon, allowing you to spend your terminal actions on attacks or powerful payload cards such as Bridge. On weaker boards, it’s a perfectly valid strategy to build a ‘Storyteller + Big Money + X’ deck, ‘X’ being a particularly strong terminal and/or a +buy card to take advantage of the massive hands this deck can generate. While most Storyteller-BM-X strategies can easily beat traditional BM, against more traditional forms of draw, Storyteller/BM decks will often fall behind when ran entirely unsupported. There are two main reasons for this: speed and reliability. Storyteller’s speed weakness is rarer, but simple. Storyteller decks aim to consistently draw most or all of your deck. When Storyteller is both unsupported and up against strong draw alternatives such as Wharf, Storyteller decks can have a hard time keeping up with the latter’s explosive tempo. Other forms of non-terminal draw such as Hunting Party and Alchemist can also threaten Storyteller’s viability on certain boards. Since Storytellers require both the card itself and 2 or 3 treasures to draw effectively, it can sometimes be quicker to simply buy and use other sources of draw over Storyteller (and its fuel) and when aiming to build a deck that draws itself. However, more important than this is Storyteller’s reliability problem. Storyteller decks are completely dependant upon having a Storyteller in their starting hand; while 4 Silvers and a Storyteller is a fantastic opener, 4 Silvers and a terminal is just a Big Money variant – slow and unimpressive. Even all of the strategies written in this article fall to pieces without access to a Storyteller in your opening hand. This makes Storyteller decks more prone to dud than other conventional draw engines. The best way to combat this is simply to have 1 or 2 more Storytellers than you’d otherwise need to fully draw your deck – having to play 1 or 2 Storytellers as cantrips every turn is well worth having a deck that runs consistently. Like most cards, Storyteller’s strength in comparison to other draw sources depends upon the rest of the kingdom. While there are many cards that interact with Storyteller directly, letting you further capitalize on the card’s strengths (more on those later), the strongest synergies are those that patch up Storyteller’s weaknesses, its speed and unreliability. For a Storyteller deck to avoid dudding, you need an opening hand of money and a Storyteller. Since money is a pretty easy thing to consistently draw, getting a Storyteller into your hand every turn will effectively negate a Storyteller deck’s chance of failure almost completely. Cards that can consistently put Storytellers into your hand every turn such as Haven, Scheme, and Save can let you fully draw with near 100% consistency, provided you still have ample Storytellers in the rest of your deck. In the absence of traditional saving cards, you can use cards such as Courtyard and Count to topdeck a Storyteller once you’re done drawing, or simply use supplemental Duration draw such as Haunted Woods to increase the likelihood of drawing a Storyteller in your opening hand. Why worry about having to buy all of your Storyteller fodder when you can have cards give you boatloads of treasure for free? Silver gainers such as Jack of All Trades, Amulet, and Masterpiece can fill your deck with excessive amounts of Silver incredibly quickly. This usually isn’t a good thing, since Silver is an engine-clogging stop card in every other scenario. Storyteller, however, lets you turn your Silvers into incredibly potent non-terminal draw (Silvers effectively becoming Laboratories when fed to a Storyteller), while still providing fantastic economy from the Silvers you don’t need for draw. Not needing to buy your Storyteller fodder lets you build at an exponentially faster rate, letting you spend your payload on more Storytellers or powerful actions. While rarer, Storyteller becomes even stronger when on the board with gold gainers such as Soothsayer or Bandit. Governor is an especially strong card with Storyteller, since it can both gain gold non-terminally and remodel them into Provinces in the late game. This being said, it’s still important to not over-gain treasures in a Storyteller deck. Thoughtlessly gaining loads of Silver or Gold will still clog your deck, making it hard to actually find your Storytellers to play. Storyteller is one of the three cards in the game (along with Black Market and Villa) that can put Treasures in play during your action phase, giving your action cards access to Kingdom Treasures’ special effects. Not only are most Kingdom Treasures simply much stronger cards overall when played as draw rather than as payload, but certain treasures can prove incredibly strong when played during your action phase. Feed Storyteller a Quarry? Your Workshops can now gain Grand Markets. Feed Storyteller a Royal Seal afterwards? Your Workshops can now topdeck Grand Markets! Bank is an especially notable example of this – any treasures fed to Storyteller count as ‘in play’, and therefore add to Bank’s total value while also helping you fill your hand with even more treasures to boost Bank! While this still takes some build-up without support, Bank-Storyteller can lead to explosive results when paired with +buy cards. Simply feeding 4 Storytellers 3 Treasures each puts all your Banks at $13 and counting, disregarding any treasures still in your hand! Platinum, while lacking any special effects, also deserves a special mention. Though expensive and hard to connect with Storyteller, Storyteller/Platinum provides near-unrivaled drawing power that can easily facilitate game-winning megaturns. Storyteller has mixed results when played with ‘virtual coin’, the economy generated by cards such as Market and Monument. Unlike treasures, you can’t control how much of your virtual coin is spent; you spend it all, then draw accordingly. Non-terminal virtual coin usually works quite well with Storyteller decks, as they can be played similar to treasures and generally benefit from being played as draw. Terminal coin-generating actions don’t work at all; the moment you’re spending actions to draw with Storyteller, you’re missing out on one of the card’s biggest strengths. Cantrip money from cards such as Peddler can situationally benefit Storyteller decks, though you lose a noticeable degree of control when utilizing these cards in a Storyteller deck. Did you play 6 Peddlers, then draw a Storyteller? It doesn’t matter how many more cards you need to draw, you’re spending all $6 or not playing the Storyteller at all. This isn’t to say that Storyteller and cantrip money are completely incompatible. Rather, caution is required when playing Storyteller with cantrip money. Think carefully when playing coin-generating actions before your last Storyteller. In some cases, it might be worth not playing your last Storyteller at all if you’d spend more coins than your drawn cards could get back. At first glance, you’d think Storyteller would be a significantly worse card with no trashing – after all, it’s harder to align your Storytellers with your Golds with 7 Coppers and 3 Estates in the way. And while this is true, these 10 junk cards also apply to every other player in the game, no matter what cards they decide to go with. As well as using Silver and Gold to increase handsize, Storyteller’s Copper-to-cantrip effect lets you cycle through your Coppers if need be. While using Storyteller as a glorified Forum isn’t ideal, it makes drawing 4 Coppers and a Storyteller often preferable to drawing 4 Coppers and a Smithy. Overall, Storyteller is a fascinating and versatile card – its reliance on vanilla Treasures makes it at least a semi-viable option in any kingdom, though depending on its support and competition, Storyteller can be totally dominant, completely outclassed, or anything in between. While Storyteller decks build and play quite differently from anything else in Dominion, the classic rules of building and balancing a coherent deck apply just as strongly. Knowing when to go for Storyteller, along with how to build your deck around Storyteller, can spell the difference between an awkward pseudo-BM deck and a spectacular 20-card megaturn. Projects are abilities everyone can have. They go in your randomizer deck or special sideways deck, like Events and Landmarks. You only play with 2 max between these and Events and Landmarks, unless you prefer to have more, I can’t stop you. Each player gets two wooden cubes, that’s right we’ve at last moved into wood, and if you buy a Project – using a buy in your Buy phase – you put one of your unused cubes on it and then have that ability for the rest of the game. You only get two cubes, even if you preferred having more than two Projects out at once. Everyone can put a cube on the same Project, there’s room for all. There are twenty Projects. Here are six of them. Star Chart lets you pick your top card every time you shuffle. It seems like that could come in handy. Yes you get to look at the cards, you don’t have to pick from the backs. And finally Innovation makes your first bought/gained Action each turn leap into play and immediately do something. Not all things are useful to play in your Buy phase (and there isn’t always a Workshop available), but it turns out a lot of things are (and sometimes, there’s a Workshop). That’s it for previews! You’ll be able to play with the previewed cards online all through the weekend; then they’ll vanish until the street date for the physical set. Which is when you’ll also get to see the rest of the cards. And when is that? Well the current guess is… late October. Very late October. So late in October that it’s almost not October. Man. A month away. But at least RGG has a lot of confidence in that estimate. The rulebook will show up online around then as usual, and once people have the cards I’ll post a Secret History. This is the fourth in a series of five preview posts by Donald X, each showing new cards and mechanics from the upcoming expansion, Dominion: Renaissance. These new cards are playable online during this week at dominion.games, so be sure to check them out! Artifacts are abilities only one player can have. When you take the Flag, you take it from whoever had it, if someone had it. So, they go back and forth. They’re like Lost in the Woods (from Nocturne); hey could I do more with that kind of thing, I thought, and I could. There are five Artifacts total, and here are three of them and their parent cards. Flag Bearer comes with a Flag. If someone takes it away from you, just buy another one. How many Flag Bearers can your deck tolerate, anyway? Well you can also trash them to get the Flag, so that won’t always be an issue. Swashbuckler is trickier. All that stuff after the colon only happens if you have cards in your discard pile – which is harder than it sounds. Part of it is, you draw the three cards before checking. The Coffers tokens don’t have to have come from Swashbuckler specifically, so sometimes that helps, but you still need a discard pile at least once to get the Treasure Chest. Treasurer can put you down a Treasure, up a Treasure, or even on Treasures. And the Key is like a Treasury. So it’s sure to be a card you treasure. 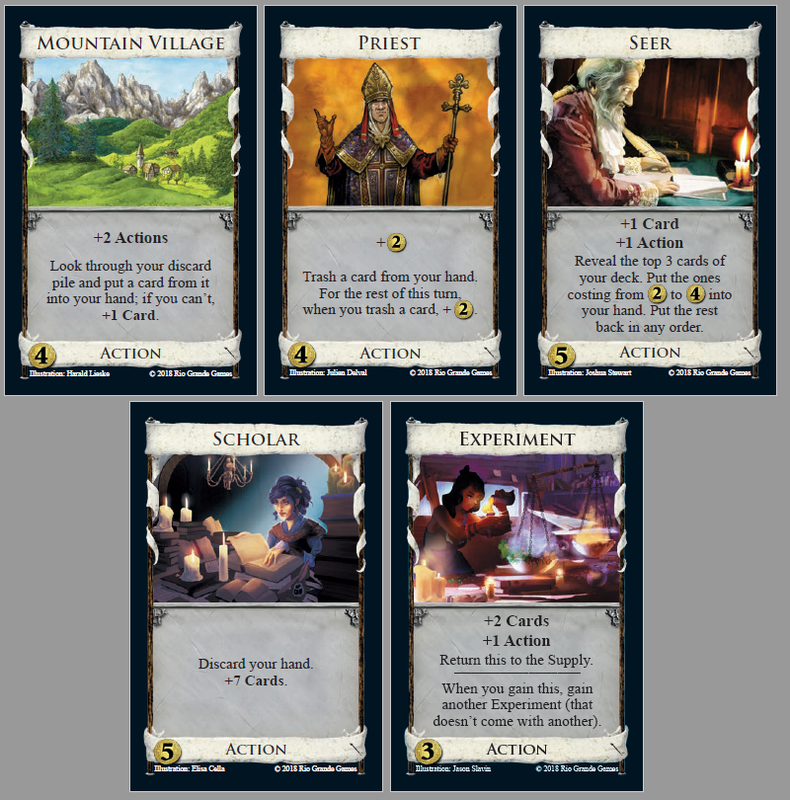 This post by Donald X. is the third of five previews for the new Dominion expansion, Dominion: Renaissance. Coffers are like Villagers but for coins. Bam. Also Coffers appeared already in Guilds, though it wasn’t called that until the later printing. It’s money you can save for later. You can only cash in the tokens before buying cards; they make +$1 each. Guilds originally said “take a coin token”; this set says “+1 Coffers.” Villain has +2 Coffers, there you go, it’s that easy. It makes the other players discard something good, except early on they’ll have Estates and later on Provinces. But you know, in the middle there, it demands a good card. This is the second in a series of five preview posts by Donald X., each revealing some cards and mechanics from the upcoming Dominion expansion, Dominion: Renaissance. Villagers are like Coffers but for Actions. I guess that explanation would have been simpler tomorrow. +1 Villager means you add a token to the Villagers side of your Coffers / Villagers mat. You can remove the token for +1 Action in your Action phase. It’s a +1 Action you can save. The actual tokens are coins, but don’t be fooled, they do double duty. I will tell you now, it’s so nice just using one type of token. So anyway, Villagers. Acting Troupe gets right to the point: 4 tokens, it’s gone. How much of a village is that exactly; what decks are possible when this is the only village-like thing? As always I leave those questions to you. Sculptor is that rare animal, a Workshop that gains cards directly to your hand. Watch out. If you gain an Action you won’t necessarily be able to play it that turn… but wait, you might have Villagers from previous plays of Sculptor. They thought of everything. Recruiter can let you really go nuts getting Villagers. Don’t go too nuts; you don’t need a giant pile of Villagers sitting there. If you missed yesterday’s preview, I am here to tell you that you can try these cards right now at dominion.games. If you did catch yesterday’s preview, I’m just wasting your time now. Dominion, that’s what you’re trying to achieve. This time in the Renaissance! Mountain Village gets back a card from your discard pile instead of drawing you a card. Or draws you a card if it can’t, you aren’t hurt there. It does some tricks; the first one you’ll see is, one Mountain Village in your hand gets back all the Mountain Villages in your discard pile. Seer draws cards costing from $2 to $4. Those aren’t your best cards but hey, you could get three of them. Scholar makes the cards go round. It’s a poster child for simplicity; this set goes the extra mile to be simpler than the previous few. This teaser was originally posted by Donald X. to the Dominion Strategy Forums. Next week, we will be posting Dominion: Renaissance previews each weekday, which will reveal various cards and mechanics from the new expansion. You will also be able to try out these new cards and mechanics for free, as they are revealed, on the Dominion Online client.